We are a family owned Australian business. All of our parts are traditionally handmade and hand finished without the aid of modern copy tools in small batches from our Perth workshop, Western Australia. 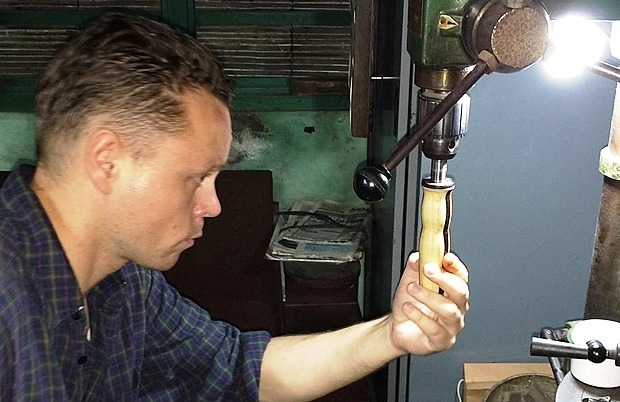 Leon Wilcox has over 20 years experience as an artisan, focusing on wood turning and antique restoration. He has applied these skills into making a unique range of handmade coffee parts and beer tap handles. Leon spends many hours making sure every customer gets exactly what they want and personally selects all of the exotic timber from specialist suppliers, choosing woods for their grain pattern and quality. Only naturally figured Australian hardwood’s are used and wherever possible the same log is cut to ensure consistent colour and curl in the grain throughout each set. Leon also regularly makes items in accordance to the customers specifications and choice of timbers. All of the metal accents are made using 317 stainless steel which has a high strength and corrosion resistance perfect for the coffee brewing environment. Each part is also machined locally in Perth to ensure each coffee part is 100% Australian made!